This year the American Association of School Librarian (AASL) chose this theme: “Making Connections at Your School Library.” The official hashtag is #AASLslm. AASL’s SLM Committee curated an outstanding selection of resources organized into four buckets—one for each week of the month of April. Congratulations Jillian Ehlers (Chair), Cynthia Alaniz, Michelle Cooper, Shannon DeSantis, Hattie Garrow, Cathy Pope, and Denise Tabscott for your fine work. While all four of these subthemes are essential aspects of future-ready school librarianship, I want to share a new resource and an additional idea for the “making global connections” subtheme. The Worlds of Words (WOW) has created global book lists that pair classic children’s and young adult literature with global books that reflect the cultural diversity of our students and our world. These fiction and informational books, organized by grade level, can support librarians’ global collection development as well as provide critically reviewed texts that can be integrated into the curriculum. 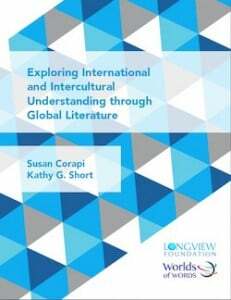 I will be spotlighting this resource in my “Intercultural Understanding through Global Literature” session at the Texas Library Association Conference on Wednesday, April 4th. During the session we will discuss the importance of critical book reviews for competent collection development and integrating global literature into our coteaching in order to help students broaden their perspectives, develop empathy, and prepare to learn, work, and live in a global society. 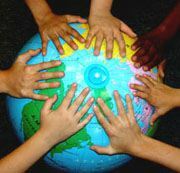 Immersing students in another culture through global literature is one way to increase their intercultural understanding. This example connects with students who may be studying weather or natural disasters as well as those learning more about life in Puerto Rico. When Hurricane María hit landfall in September, 2017, all of the books and other resources were stored in the Antonio S. Pedreira Elementary School Library. They lost everything. My colleague and fellow WOW Board member Carmen Martínez-Roldán, an associate professor of bilingual/bicultural education, is supporting the rebuilding efforts of the Antonio S. Pedreira Elementary School Library in San Juan, Puerto Rico. These students, educators, and families must rebuild their school library from the ground up. Carmen recently launched a GoFundMe.com campaign to support students, educators, and families in recreating their vital resources for learning. One way to launch an inquiry and engage students in making global connections is to read books about Puerto Rico. (See the list of books in the comment section below.) 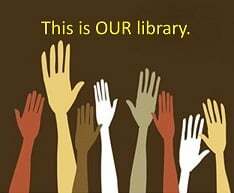 If yours is a school library of plenty, reaching out to help rebuild a school library for the benefit of global classmates is a way to make global connections and a most worthwhile way to celebrate School Library Month 2018. Wishing you the best for #AASLslm 2018! Picture Book Month was founded by author and storyteller Dianne de Las Casas and her children’s book author/illustrator colleagues. The 2017 celebration is particularly heart-felt since this is the first year of the annual event since Dianne passed away in a tragic house fire. Picture Book Month is on a mission: “In this digital age where people are predicting the coming death of print books, picture books (the print kind) need love. And the world needs picture books. There’s nothing like the physical page turn of a beautifully crafted picture book” (http://picturebookmonth.com). Every day in November, the Picture Book Month Web site offers a new post from a picturebook champion explaining why he/she thinks picturebooks are important. School and public librarians will want to tap into this resource, think about their own picturebook selection practices, and consider how the information on the site can serve the literacy needs of children (and teens), families, and educators. “Picture books are books in which both words and illustrations are essential to the story’s meaning… In a true picture book, the illustrations are integral to the reader’s experience of the book and the story would be diminished or confusing without the illustrations” (Short, Lynch-Brown, and Tomlinson 50). My article “The Mighty Picturebook: Providing a Plethora of Possibilities” appeared in the Fall 2017 issue of Children and Libraries, the journal of the Association for Library Services to Children. The photograph above was published on the cover. As can happen, my article was shortened to fit into a tight space. These are the main subheadings in that article and some of the information that ended up on the cutting room floor. The photograph above shows a 12-year-old sister reading to her 5-year-old brother on the eve of his first day of public school kindergarten. Ready and Waiting for You was expressly created for this very purpose—for more proficient readers to engage emerging readers in conversations about what they will experience when they begin formal schooling. Engaging in dialogic reading with a trusted reader builds literacy skills and in this case, can build excitement and help ease the fears of young children. Children who are new to school or transferring to a new school can ask and get their questions answered by a trusted older reader. Word count and book length should not be the primary criteria for book selection. Many of today’s picturebooks offer fewer words. Are some stories constrained by lower word counts or the typical 32-page limit? 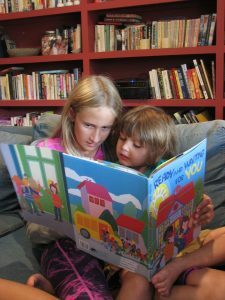 It is important for anyone who shares picturebooks with young children to realize their “willingness to listen to stories grows with experience, which may result in a younger child who has been read to regularly having a much longer attention span than an older child with no story experience” (Short, Lynch-Brown, and Tomlinson 51). “The ability to make meaning from images is an essential twenty-first century skill. Visual images dominate access to ideas and information via the screens that are all-pervasive in daily life” (Moreillon 2017, 18). Studying the illustration media and techniques used by picturebook illustrators can give youth a greater appreciation for the sophistication of this artform. Picturebook illustrations can inspire students to illustrate their own texts and give budding artists ideas for a possible career in illustration or graphic design. Picturebooks can serve as mentor texts for reading comprehension strategy instruction. While word count is not the sole criterion for an appropriate mentor text, picturebooks that offer complete story arcs with developed characters and compelling themes tend to contain a thousand or more words. There are many examples in my professional book Coteaching Reading Comprehension Strategies in Elementary School Libraries: Maximizing Your Impact (Moreillon 2013). In addition to elementary school use, picturebooks are also used in middle and high school classrooms and libraries to teach comprehension strategies and literary devices. For example, picture books by Australian author-illustrator Shaun Tan provide opportunities for educators to model drawing inferences and for students to engage in rich discussions and infer themes for Tan’s sophisticated work. One such book is The Rabbits written by John Marsden and illustrated by Shaun Tan. This sophisticated picturebook addresses the historical fact that some people have used technological advances to invade, dominate, and oppress indigenous people. This text clearly portrays the power of an analogy to communicate deep meaning. Although categorized as picturebooks, Tan’s work is not intended for a young child audience. “Picturebooks offer exceptional opportunities for literacy learning and teaching as well as pleasure reading in preK-12 schools and libraries. When authors and illustrators create and publishers publish picture books with complete story arcs, compelling themes, intriguing illustrations, and rich information, parents and families, school and public librarians, classroom teachers and reading specialists can use these authentic texts in a plethora of ways” (Moreillon 2017, 19). Check out the Picture Book Month calendar to see which authors and illustrators are participating this year. The Web site includes links to author and illustrator pages and provides resources and activities for students, educators, and families. Celebrate the beauty and power of this artform to shape family literacy practices, to offer children mirrors and windows on the world, and bring delight to those who read or listen to the mighty picturebook. Moreillon, Judi. 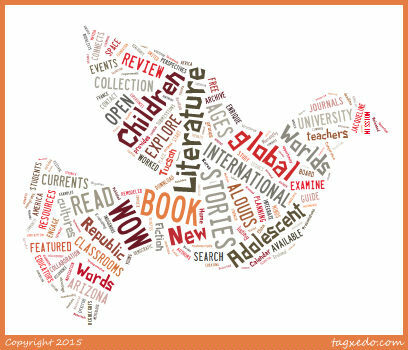 “The Mighty Picturebook: A Plethora of Possibilities.” Children and Libraries, vol. 15, issue 3, 17-19. Moreillon, Judi. Ready and Waiting for You. Grand Rapids, MI: Eerdmans Books for Young Readers, 2013. Short, Kathy G., Carol Lynch-Brown, and Carl M. Tomlinson. Essentials of Children’s Literature. 8th ed. Boston: Pearson, 2014. This month, the Building a Culture of Collaboration co-bloggers will share how school librarians can be and are being essential team members in STEM, STEAM, and STREAM initiatives. These interdisciplinary efforts offer sky-is-the-limit opportunities for school library leaders. STEM, STEAM, and STREAM are hot topics in education. Some would say these are THE 21st-century subjects and the key to students’ futures. With a focus on innovation to solve the world’s persistent problems, science, technology, engineering, mathematics, art, and yes! reading are particular areas of focus in the taught curriculum across the United States. Terry framed his presentation in terms of the “learn by doing” Next Generation Science Standards. The “quick search” guide on this Web site is a useful tool for any school librarian looking to connect her/his teaching and planning and coteaching with classroom teachers. Knowing these standards are step one in order to be a STEM-ready educator. Terry’s presentation focused on resources for school librarians to use to increase their own knowledge, build STEM/STEAM/STREAM library collections, and use resources to reach out to classroom teachers and specialists for interdisciplinary learning and teaching. He recommended resources such as Science Books & Films to help school librarians build their collections. Terry also recommended setting up “search alerts” for magazine tables of contents and following publications by children’s science book authors. Terry talked about science read-alouds for younger students and recommended the book: Perfect Pairs: Using Fiction and Nonfiction Science Books to Teach Science, K-2 by Melissa Stewart and Nancy Chesley. He noted that What Is Science? written by Rebecca Kai Dotlich, illustrated by SachikoYoshikawa should be included in every elementary school library collection. He noted that STEM/STEAM/STREAM fairs, formerly “science fairs,” should take a problem-solving approach. In this vein, Terry encouraged school librarians to help students answer their “why” questions, especially if classroom teachers shy away from pursuing questions with uncertain answers or outcomes. As an elementary school librarian, one of my favorite and oft-repeated teachable moments was when a small group of children brought in a “wonder” from the playground… an as-yet unidentified insect or other critter or plant they had “discovered” at recess. I relished my responsibility to guide students in asking questions about the “wonder” and to have ready-reference materials on hand for them to find the answers. Classroom teachers often gave students time to conduct these spontaneous learning opportunities and some picked up on these investigations and furthered them with the whole class. 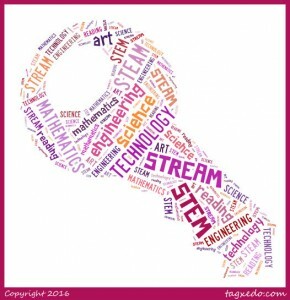 There is much individual school librarians can do to shore up their own knowledge and the library’s resources in order to teach and support classroom teachers, specialists, and students in exploring interdisciplinary STEM, STEAM, and STREAM curriculum. On Thursday, I will share a K-12 district-wide initiative that seeks to support and build classroom-library instructional partnerships for these efforts.